The Ricoh Group identifies the risks and opportunities that global environmental problems and the resulting social changes could present to business management, and makes decisions for sustainable environmental management based on the results. Mankind is now changing direction significantly to achieve a sustainable society with low environmental impact. The key to forging a new path is to develop environmental technologies that will bring about a dynamic revolution comparable to the Industrial Revolution. When society undergoes dramatic changes, market needs change significantly too. In an extreme instance, the market might begin to demand products with nearly zero environmental impact that can work without consuming any resources or energy. In this age of the "environmental industrial revolution," the Ricoh Group recognizes that it will face tremendous risks if it cannot respond properly to changes in market needs; for large changes in particular, it is too late to respond to them after they become clear. It is vital that we put ourselves on the alert by predicting future social change. Companies can strengthen their competitiveness and access more chances in the market by identifying and preparing for any possible future environmental risks. Accordingly, the Ricoh Group predicts market needs for a sustainable society with minimal environmental impact and sets environmental goals for 2030 and 2050 in the areas of global warming prevention and resource conservation and promote sustainable environmental management. A considerable change came about in non-financial information disclosure. At the G20 summit in July 2017, Financial Stability Board (FSB) Task Force on Climate-related Financial Disclosures (TCFD) published Recommendations Report as a framework to recommend companies to disclose mid and long-term climate change-related risks and opportunities and their financial impacts in mainstream financial reports. Then, we develop risk mapping of these items and prioritize them to identify enterprise-level risks and opportunities. If the Ricoh Group cannot respond to market needs for products with nearly zero environmental impact, it might not be able to continue in business in the future. Against this risk, we will develop environmental technologies that contribute to reducing the environmental impact of both our business and society as a whole and provide the market with products and services that closely meet its needs, thereby becoming a front runner in the environmental field. If resources become more scarce or depleted, the Ricoh Group might not be able to continue its manufacturing operations. To prepare for this risk, we are developing new technologies and alternative resources, improving our product designs, and renovating our production processes. We are also committed to identifying the environmental impact of our products throughout their lifecycles and to developing technologies to reduce that impact, believing that we will be able to meet the product specifications that a future society might expect by reducing the environmental impact of our business operations and products throughout their lifecycles. In order to reduce the environmental impact of our products throughout their lifecycles, it is essential to cooperate with our partners, shown by the Comet Circle. In other words, if any of our partners has a serious impact on the environment, this could pose a risk to the Ricoh Group, but it could also present a great opportunity for the Group to reduce its environmental impact and costs to collaborate with reliable partners. The Ricoh Group has a range of impacts on the global environment in consuming resources and energy, using and emitting environmentally sensitive substances, and recycling products. It faces environmental risks from its past, present and future business activities, which are influenced by environmental laws and regulations. However, the Ricoh Group believes that it is its social responsibility to help society reduce its environmental impact, and for this it is sometimes necessary for companies to adhere to the market mechanism as well as laws and regulations. The Ricoh Group believes that companies that are really committed to solving problems in society should embrace the relevant laws and regulations instead of just regarding them as risk factors. 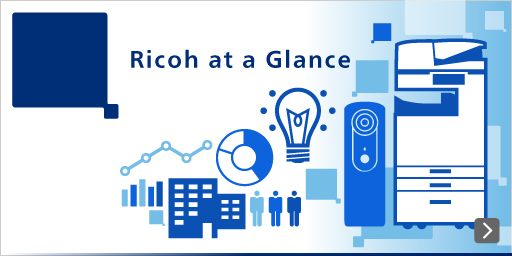 The business environment surrounding the Ricoh Group is changing every day, and it exposes us to serious risks. To deal with these risks, the Ricoh Group is implementing total risk management (TRM) by appointing departments to manage each risk on the initiative of the Internal Management & Control Division. By preparing for these risks and preventing them from materializing (in the form of noncompliance, accidents, and other problems), we will keep the trust of society and our customers, which will in turn help us grow our business.